Hey yall! 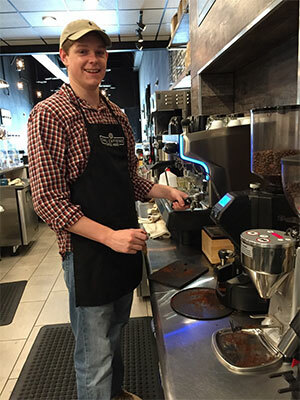 It’s time for you to meet the next barista in our feature series, McNeil Beasley! McNeil was out third employee, starting with us not long after we opened last year. We knew him and his family through our church and we thought he would be a good fit with us here at SC. It was the right call for sure! He joined us last March and has been such an important part of our team. This was McNeil’s first job and to brag on him a little bit, he is great at it! He is awesome with our customers, makes great espresso, and pours some mean latte art. This fall, he’ll be going into his senior year at Spanish Fort High School and plans to go on to Auburn University and pursue a degree in engineering. Favorite Personal Creation – Cortado (two short espresso shots with milk, steamed not quite as hot as a latte), made with two different beans – our signature espresso and our current featured "Duck and Cover" espresso. And thanks SC community for spending a few minutes with us and meeting McNeil today! Come on by Soul Caffeine and say hello!